Judging by sharp reactions of U.S. capital and currency markets, success of these proposals has been quickly accepted. Such was the case with the fiscal stimulus package of 2009, as well as with Quantitative Easings 1 and 2; initially there were highly favorable market reactions. In these cases the rush to judgment was misplaced as widespread economic gains did not occur, and the U.S. experienced the weakest expansion in seven decades along with lower inflation. It could be that the fundamental analytical mistake now, like then, is to assume that the economy is “an understandable and controllable machine rather than a complex, adaptive system” (William R. White, in his 2016 Adam Smith Lecture “Ultra-Easy Money: Digging the Hole Deeper?” at the annual meeting of the National Association of Business Economists). While many of the aforementioned proposals include pro-growth features, it appears that there is an underestimation of the negative impact of delayed implementation and other lags. Additionally, the risks of unintended adverse consequences and outright failure are high, especially if the enacted programs are heavily financed with borrowed funds and/or monetary conditions continue to work at cross purposes with the fiscal policy goals. A possible additional negative result of the repatriation is that those assets denominated in foreign currency, estimated to be 10% to 30%, will need to be converted into U.S. dollars. This will place upward pressure on the dollar, reinforcing the loss of market share of U.S. firms in domestic and foreign markets. Tax repatriation was tried on a smaller scale during the Bush 43 administration in 2005-2006 with limited success. A much smaller amount of funds were repatriated, and the dollar showed strength. Regulatory reform could create increased energy production which would clearly boost real economic activity. This is accomplished by shifting the upward sloping aggregate supply curve outward and thereby lowering inflation. When the aggregate supply curve shifts, it will intersect with the downward sloping aggregate demand curve at a lower price level and a higher level of real GDP. The falling prices are equivalent to a tax cut that is not financed with more federal debt. Regulatory reform is a strong proposal and will benefit the economy greatly, in time, by making the U.S. more efficient and better able to compete in world markets. However, these benefits are likely to build slowly and accrue over time. Without question, the regulatory reform is the most unambiguously positive aspect of the contemplated fiscal policy changes since it will produce faster growth and lower inflation. Since bond yields are very sensitive to inflationary expectations, this program would actually contribute to lower interest costs as the disinflationary aspects of the program become apparent. Proposals to cut the trade deficit by tariffs or import restrictions would have the exact opposite effect of the regulatory reforms and increased energy production. They would shift the aggregate supply curve inward, resulting in a higher price level and a lower level of real GDP. Any improvement in the trade account would reduce foreign saving, which is the inverse of the trade account. Since investment equals domestic and foreign saving, the drop in saving would force consumer spending and/or investment lower. Any improvement in the trade account would be limited since the dollar would rise, undermining the first round gains in trade. The more serious risk is that other countries retaliate. From the mid-1920s until the start of WWII this process resulted in what is known as “a deflationary race to the bottom”. If monetary conditions are tightened and interest rates continue to rise, economic growth from tax reductions are likely to prove ephemeral. Monetary conditions have turned more restrictive in the broadest terms over the past year and a half. 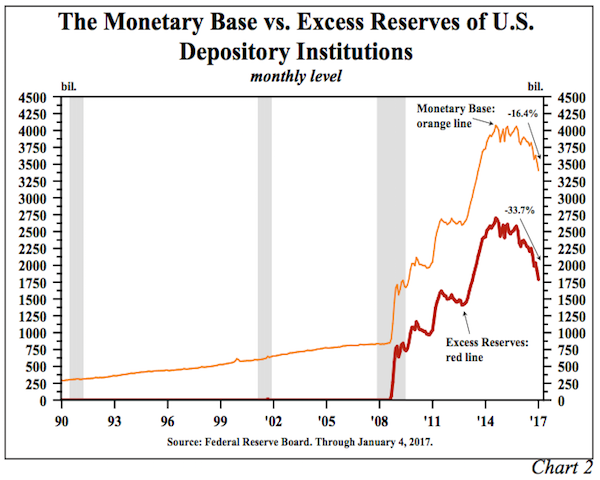 The monetary base and excess reserves of the depository institutions have been reduced by $668 billion (16.4%) and $910 billion (33.7%), respectively, from the peaks reached in 2014 or as the Fed was ending QE3 (Chart 2). This reduction in reserves is in fact an overt tightening of monetary policy, which will restrain economic activity in a meaningful way in the quarters ahead. While maintaining the existing large portfolio of treasury and agency securities, the Federal Reserve has engineered contractions in the base and excess reserves by taking advantage of swings in other components of the base. The decrease in the reserve aggregates since 2014 reflects the following developments: (a) the substantial shift in Treasury deposits from depository institutions into the Federal Reserve Banks; (b) an increase in reverse repurchase agreements; (c) a shift from currency in the vaults of depository institutions to nonbanks (i.e. the households and businesses); and (d) a rise in required reserves as a result of higher bank deposits. These changes were necessitated by the Fed’s decision to raise the federal funds rate by 25 basis points in December of both 2015 and 2016. The Fed had the power to offset the reserve-draining effects of the shifting Treasury balances as well as the need for more currency and required reserves, but they chose not to do so. The cause of the sharp drop in monetary and excess reserves is immaterial, but the effect is that monetary policy became increasingly more restrictive as 2016 ended. Monetary policy has become asymmetric due to over-indebtedness. This means that an easing of policy produces little stimulus while a modest tightening is very powerful in restraining economic activity. The Nobel laureate Milton Friedman held that through liquidity, income and price effects, (1) monetary accelerations (easing) eventually lead to higher interest rates, and (2) monetary decelerations (tightening) eventually lead to lower rates. (In the near-term monetary accelerations will lower short-term rates and decelerations will raise short-term rates..."the liquidity effect".) Friedman’s first proposition becomes invalid for extremely indebted economies. When reserves are created by the central bank, even if the amounts are massive, they remain largely unused, rendering monetary policy impotent. That is why M2 growth did not respond to the increase in the monetary base from about $800 billion to over $4 trillion. Plummeting velocity, which reflects too much counterproductive debt, further emasculated the central bank’s effectiveness. Thus, the efficacy of monetary policy has become asymmetric. Excessive debt, rather than rendering monetary deceleration impotent, actually strengthens central bank power because interest expense rises quickly. Therefore, what used to be considered modest changes in monetary restraint that resulted in higher interest rates now has a profound and immediate negative impact on the economy. This is yet another example of the adaptive nature of economies possibly unnoticed by federal officials. Friedman’s second proposition is clearly in motion. While monetary decelerations may initially lead to higher interest rates the ultimate trend is to lower yields. The Fed’s operations raised short- and intermediate-term yields in 2016. Although Treasury bond yields are mainly determined by inflationary expectations in the long run, the Fed contributed to the elevation of these yields in the second half of 2016 as well as a flattening of the yield curve. Working through both interest rate and quantitative effects, the Fed added to the strength in the dollar, which was further supported by international debt comparisons that favor the United States. The Fed stayed on the tightening course during the fourth quarter as the economy weakened. This suggests that the Fed contributed to both the rise in interest rates and the stronger dollar. More importantly, in view of policy lags, the 2016 measures by the central bank will serve to ultimately weaken M2 growth, reinforce the ongoing slump in money velocity, weaken economic growth in 2017 and accentuate the other constraints previously discussed. Over time, birth, immigration and household formation decisions have been heavily influenced by real per capita income growth. 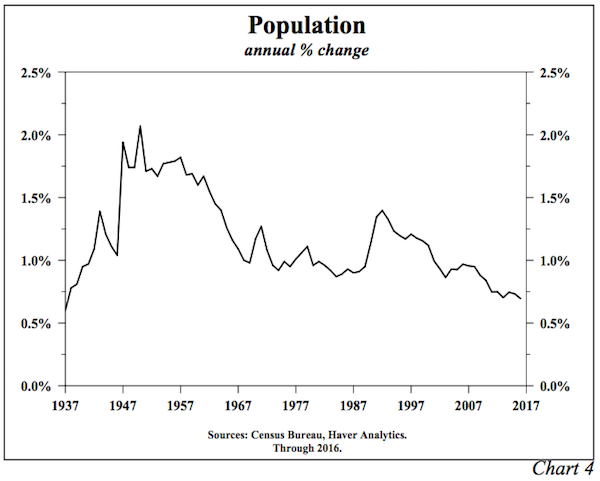 Demographics have, in turn, cycled back to influence economic growth. If they are both rising, a virtuous long-term cycle will emerge. Today, however, a negative spiral is in control. 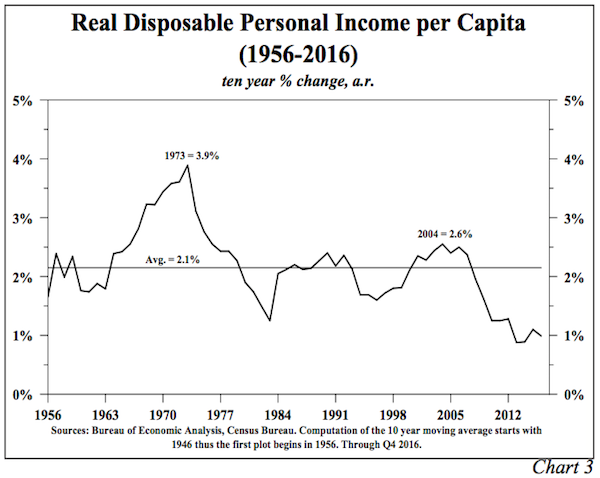 In the ten years ending in 2016, real per capita disposable income rose a mere 1%, less than half of the 50-year average and only one-quarter of the growth of the 3.9% peak reached in 1973. In view of the enlarging debt overhang, which is the cause of these mutually linked developments, economic growth should continue to disappoint. There will likely be intermittent spurts in economic activity, but they will not be sustainable. Our economic view for 2017 suggests lower long-term Treasury yields. Considering the actions of the Federal Reserve to curtail the monetary base and excess reserves, M2 growth should moderate to 6% in 2017, down from 6.9% in 2016. In the fourth quarter, on a 3-month annualized basis, M2 growth already decelerated below the 6% pace anticipated for 2017. This is unsurprising given the fall in excess reserves and the monetary base. Velocity fell an estimated 4% in 2016 on a year ending basis. We assume there will be a similar decline for 2017, although in view of the huge debt increase and other considerations, velocity could be even weaker. On this basis, nominal GDP should rise 2% this year, which means inflation and real growth will both be very low. A 2% nominal GDP gain for 2017 points to a similar yield on the 30-year in time, meaning that the secular downward trend in Treasury bond yields is still intact. Feb. 12, 2017, 2:12 p.m.
Don’t you think, IF, the repatriation of the overseas’ liquid assets are addressed properly , many if not most of the ” pitfalls ” you have outlined will at the least greatly reduced and possibly eliminated. This opportunity is “mana from heaven” ! Feb. 9, 2017, 9:18 a.m.
A day of reckoning will have to happen. A reset. This is all counterfeit currency, looking for a title to buy. We get double talk. White women were told to avoid child birth because the world is over populated. Now we import immigrants because white women did not have enough educated skilled babies to support their parents. This is the same double talk, all double talk. The Dow was 995 US silver dollars in 1966 and 995 US silver dollars in 2016. It’s a counterfeiting currency bubble. It’s a fraud. There has to be a reset to integrity and reality, somehow, some way. The 1%, and Wall Street bankers, brokers, owners, and governments are the winners. Main Street, the 99%, the children, families, renters, and employees are the losers, the prey, being preyed upon. The counterfeiting has created a great distortion between the 1% and the 99% that is going to require a reset, somehow. Numbers are not real. We don’t need billionaires, created only by inflation, not real work. A reset will occur, by inflation, deflation, or war. Protect yourself. Thanks for the info. Feb. 9, 2017, 7:05 a.m. The argument that QE failed to reignite the economy was no argument against buying stocks. 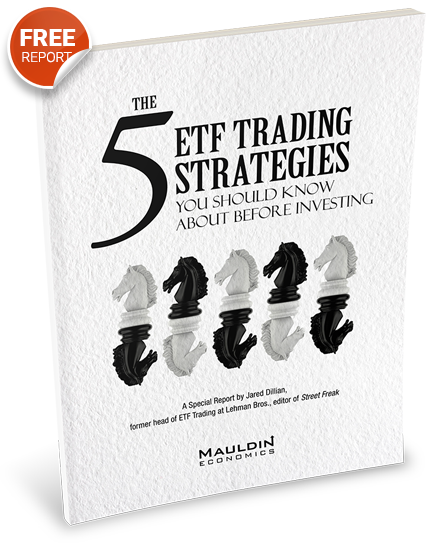 Going all-in on the first news of QE and remaining invested was the best strategy. Thus, who is to say that while the Republican agenda is not going to boost the economy much, the positive reaction in stock markets was therefore inappropriate. If policies favour corporate America and in particular the largest stocks that dominate indices, buying these names and the market in general was a rational response to policy changes. To argue that buybacks and dividends do not boost the economy suggests a causality that does not exist. When companies that generate excess cash choose to return it to shareholders rather than make value-destroying investment, it is the job of those shareholders to reallocate the funds to companies that will invest in value-adding business. To argue that buybacks add nothing to growth is to argue that financial markets are not fit for purpose, but there is no direct connection between returning money to shareholders and low growth. 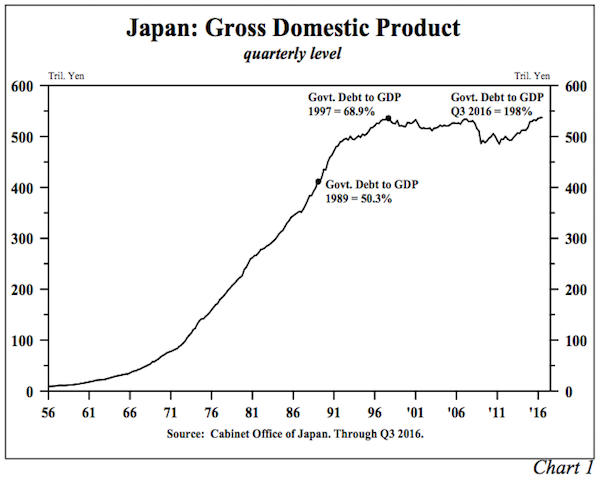 We always hear about the disaster in Japan and how pushing debt to a reported 198% of GDP has achieved nothing. Perhaps those in power will view this from a glass half full perspective and note how high debt can be driven without triggering default. The Yen is 112 to the dollar compared with 120 ten years ago, which is no big deal either way, in spite of some large interim moves. If a further debt blow out is used to advance the political end of tax reduction, rather than an economic one, the administration may conclude that is entirely manageable, with Japan as precedent. I appreciate Hoisington has been bullish and right on Treasuries for the longest time, but the connection between a weak economy and the stock market, as advanced throughout this site, is not being borne out and it may be time to ask why. The answer is patently not that investors are stupid, much as this is hinted at as the reason on this site. Feb. 8, 2017, 8:22 p.m.
” A 2% nominal GDP gain for 2017 points to a similar yield on the 30-year in time. . . .” Are bond markets very inefficient, or bond buyers very stupid or hostage? A 2% nominal GDP in 2017 justifies a 2-5 year rate of 2%. Possibly, a 2% rate for 10 years since after 5 years only 5 years remain to maturity. But, after 5 years, 25 years remain to maturity on a 30-year bond. No one can forecast the inflation and real GDP growth for 25 years, which would require at least a 1% margin of safety on 30-year bonds, unless something stupid is going on here. Why is the bond market so reliably inefficient or stupid? Another way of asking that is why does the THIRTY YEAR bond swing by 100 basis points and back in 9 months with 351 months to maturity, or 30 basis points and back in one week with 1,559 weeks to maturity (without world war, inflation or depression)? Feb. 8, 2017, 7:49 p.m.
“Numerous signposts of this late cycle risk include low factory use, weakness in new and used car prices as well as most discretionary goods, a rising delinquency rate on the riskiest types of vehicle loans and a fall in office and apartment vacancy rates.” I do not understand why a fall in office and apartment vacancy rates provide the same signpost as a rising delinquency rate on the riskiest types of vehicle loans. Could you help me understand this please. Thank you.